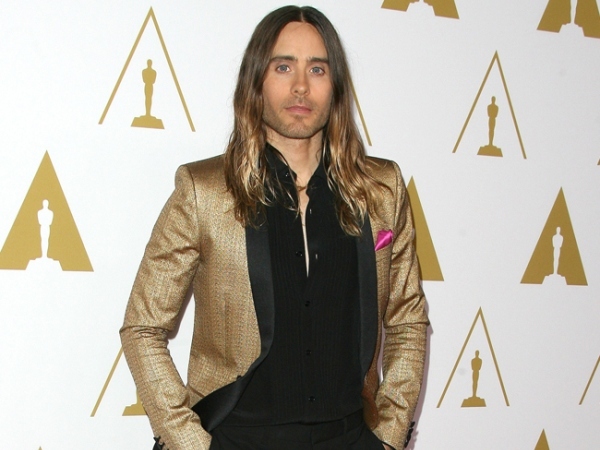 Jared Leto has already dented his Oscar Award after accidentally hitting it on the banister. Jared Leto has dented his Oscar Award. The Dallas Buyers Club star won the Best Supporting Actor prize for his role as Rayon in the biopic at the event over the weekend but he has already managed to damage the trophy after accidentally hitting it on the banister while showing it off to his friends. He said: "True story, I was letting some of the people that I work with take a picture with the Oscar, and I was carrying it downstairs and boom - I hit the railing on the stairs and I put a little nick in the back of it. It's already lived in, as they say." Meanwhile, the 30 Seconds to Mars frontman has decided to stash his award in the kitchen, disguised by some food, so that he can look at it every time he comes home. He explained to Entertainment Tonight Canada: "The Oscar is sitting in my kitchen guarded by some vegan butter and a bag of popcorn". "That is the first place I go when I go home. You put your keys down, you take off your jacket and you put your Oscar in your kitchen."